Kettle Chips certainly keep it simple. And so shall we. Color coded bags. Colors associated with the flavor. Minimalist design. Plain but fairly perfect. The Snap Test revealed a perfectly broken Chip straight down the middle. The crunch was not sharp, but the Chips remained firm throughout the eating process. They didn't turn to mush like so many Chips do. The bag contained mostly smallish sized Chips. Most appeared to have a rugged surface, as if the oil had just begun to sizzle rather than boil before they were hauled out. There was a visible layer of oil before the seasoning was added. This was black pepper with the odd tiny fleck of red thrown in for good measure. There did not seem to be as many odd shaped Chips as usual. Hickory? Perhaps. Barbecue? Definitely. Mild? 'fraid so. These were really nice Barbecue flavored Chips. If that description sound a little vague and bland, it is supposed to. Kettle Brand have smashed it with this flavor. It will not offend any purchaser and some will absolutely love it. 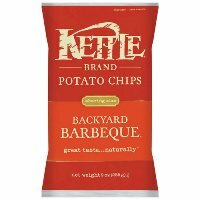 To us, they were a bit meh, but that is just an opinion - If we were to recommend a Barbecue Flavored Chip that was good in every department but did not excel any one particular event, we would describe this as the supreme decathlete of Barbecue Chips.